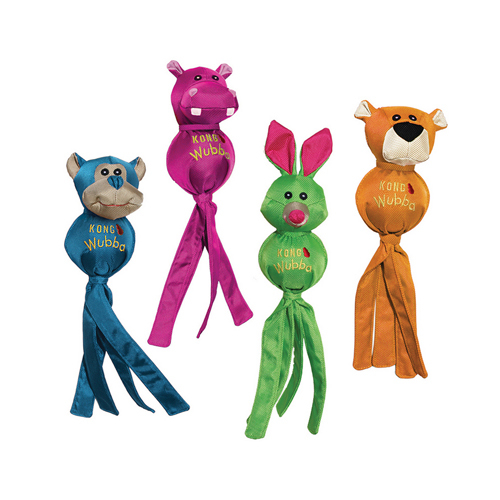 The KONG Wubba Ballistic Friends are cheerful friends for playing pulling and fetching games with your dog. These toys are made from a strong nylon and easy to pick up and throw away thanks to the strings on the tail. Available in four funny figures: orange panther, green rabbit, pink hippo and blue monkey. Inside or outside: the Wubba Ballistic Friends from KONG are strong toys for your dog. The funny figures are encased in a layer of durable nylon for extra strength. Every animal has a tail with strings. This makes it easy to pick up and throw the toy. Please note: Despite their strong encasement, the KONG Wubba Ballistic Friends are not suitable for long chewing sessions. This product is selected at random. This means that you cannot select your preferred animal and colour. You will receive one Ballistic Friend. Have you used KONG Wubba Ballistic Friends before? Let us know what you think about this product.